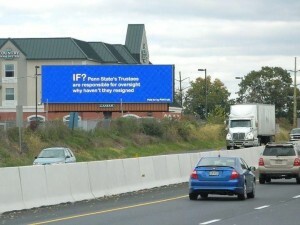 PennLive.com has a story today about a another billboard with anti-trustee messages. But this one is a little farther from State College, where other critical billboards have emerged in recent months. The electronic billboard featured in today’s story is visible from Route 581 in Lemoyne, just across the river from the state capital. Twitter has reported there are actually three along Route 15, which is in the same area as the one in the article. The new location illustrates the high level of anger that persists among Penn State supporters, even as we near the one-year anniversary of the Sandusky scandal. It certainly doesn’t appear to be going away, and might even be rising. As Penn State supporters take their messages to other parts of the state, hopefully they will begin to have an impact.